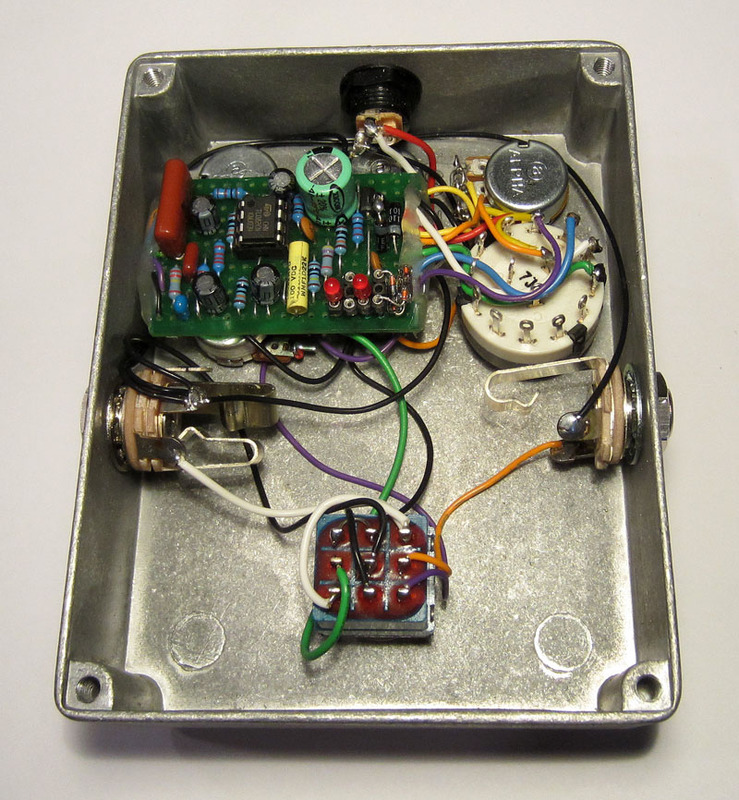 Back in the 70's I used build my own distortion pedals, usually modeled after a Vox Tone Bender, a Dallas Arbiter Fuzz Face, Craig Anderton's Quadrafuzz or his Tube Sound Fuzz. Well, i decided to build a few again, and for a limited time, I'm going to offer two of my current favorites that I recently built for myself. 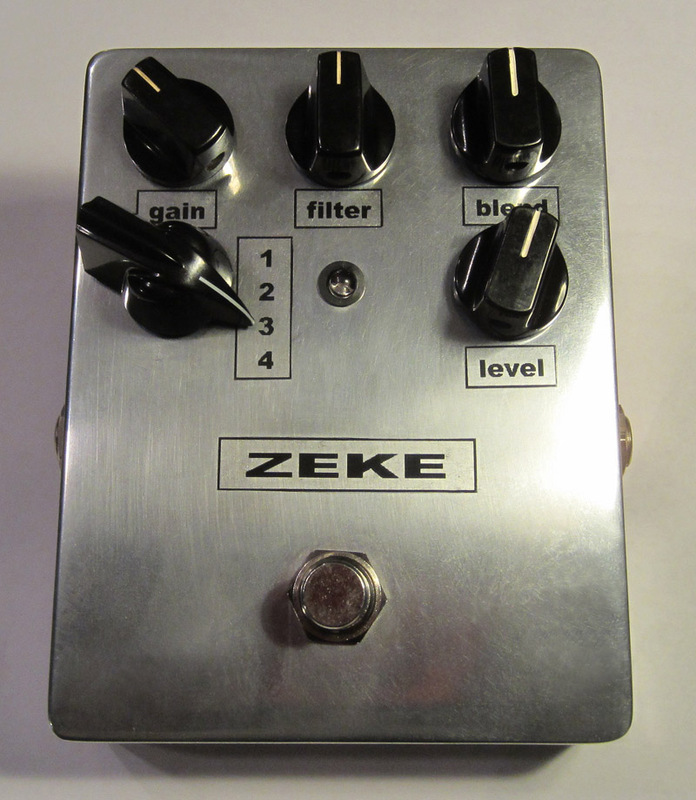 This is an extremely limited run, as I will only be building 10 FAT-TONES and 15 ZEKES. NOTE: SORRY, I have built and sold all of both of these pedals that I intend to build. This CD4049UBE based distortion doesn't eat up all your low end and tracks great with either a pick or your fingers. It can be used as a clean boost by running the gain at the minimum (fully CCW), if you just want to drive the front end of your amp to get it's natural distortion. 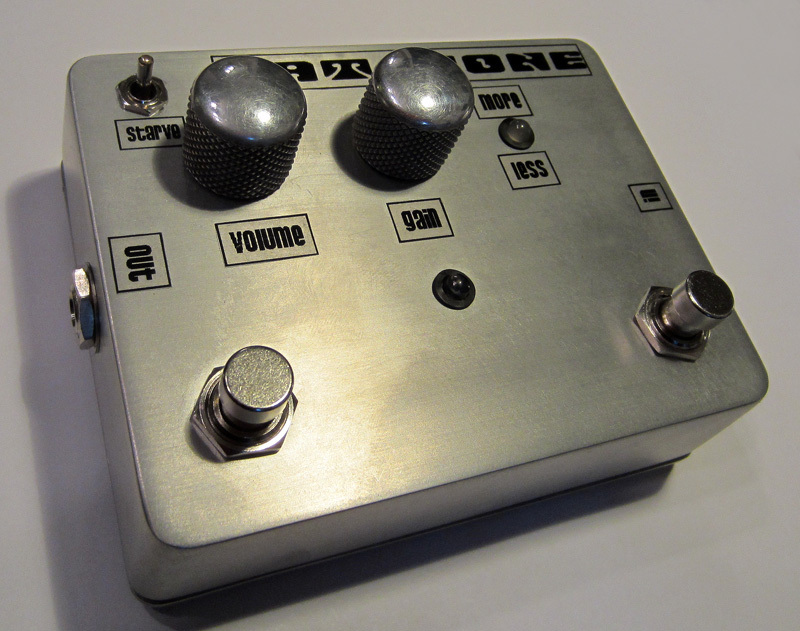 It can also go from a mild overdrive to full out high gain distortion. The circuit in this one is point to point. There are two foot swtitches. The one on the left turns the overdrive on and off (as idicated by the center blue LED. The one on the right is to boost the signal even more as indicated by the 'more/less' LED (green=OD & red = boost). 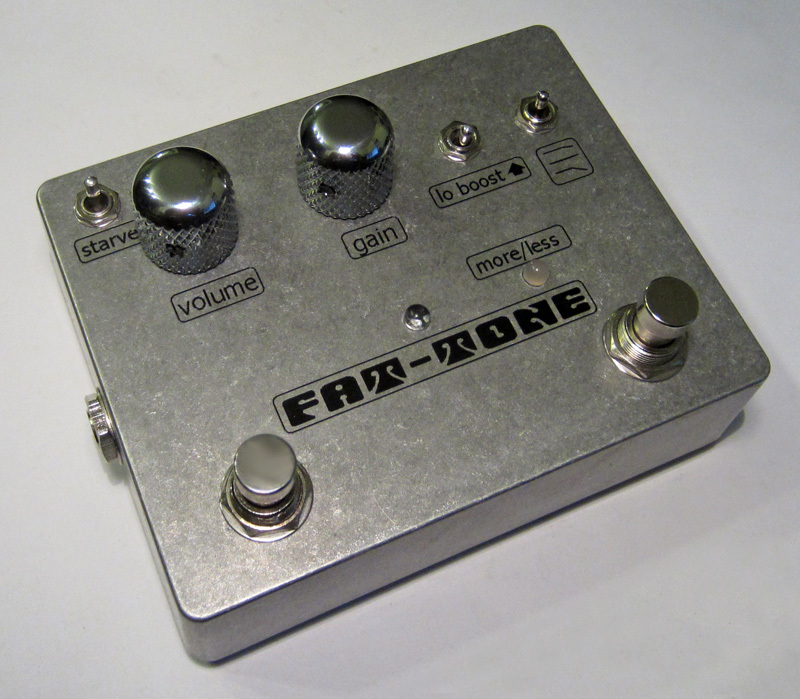 To make the pedal even more versatile, I've added a 'starve switch' which 'roughs up' the character of the pedal and makes it sound even 'fatter'. This 'two knob' pedal is about as simple as it gets to get a HUGE overdriven bass tone in seconds. The FAT-TONE sells for $269.99 including shipping in the ContUSA. Due to time constraints, I will only be making 10 of them so if you're considering one, you may want to get one while you can. 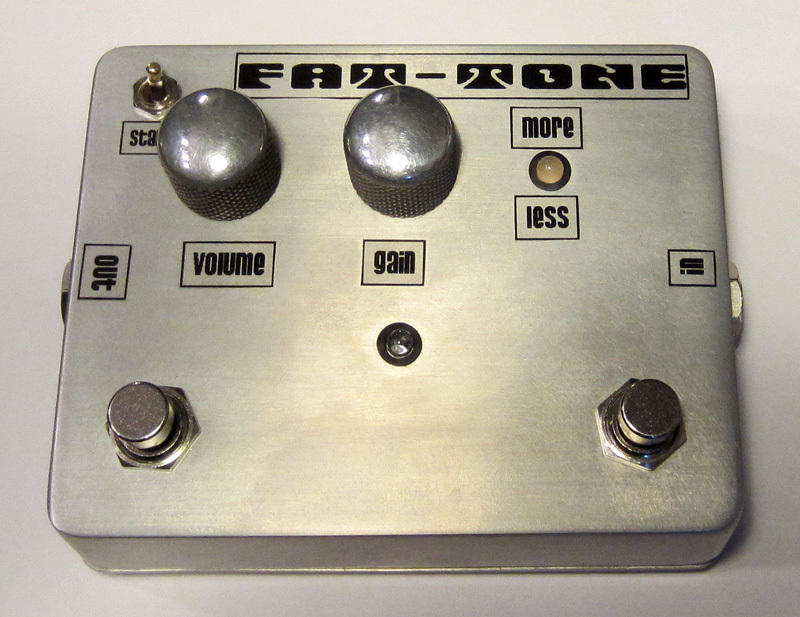 This is a handmade version of a famous and collectible a pedal that has been discontinued for years now (the DAM Ezekiel 25:17), but it has become another one of my favorites for a bass OD/distortion pedal. It's versatility includes a blend knob that allows you to blend your clean signal with the distorted one,or run the distortion without any clean if desired. On top of that, you can choose four different clipping modes with the pointer knob, going from a fuzzy distortion to a mild overdrive with or without a mids boost. There's no loss of low end in this pedal, and it features a filter control to roll off the highs of the distortion. All 15 of these pedals have been sold and shipped. Both pedals feature true bypass switching, high quality components including genuine Neutrik jacks and operate on either a 9V battery or a standard 9V center ground power supply. A modifed version of the Tube Sound Fuzz, but with a few additional features and tweaks so that it works great with a bass. I call it the "FAT-TONE". If desired, it now can include (not shown) a three way toggle that offers: a flat, a slight hi-cut, and a 'more' hi-cut switch for those of you that want to use it direct to a mixing console and limit the top end (this option runs $20). All 10 have of them have been sold. 4. Extra boosted Overdrive with FAT mids and more bass. Both of the clips were done with a Fender '59 AVRI Precision bass, (maple neck/alder body), with stainless rounds, into an Ampeg SVT7 Pro / 2x15 Eminece 3015 (non-LF) cabinet, recorded with a Zoom H4n approx 8" off of the top speaker. Here's a picture of some of the other overdrive/distortion pedals that I own, but the two that I'm offering above are the best of the bunch. 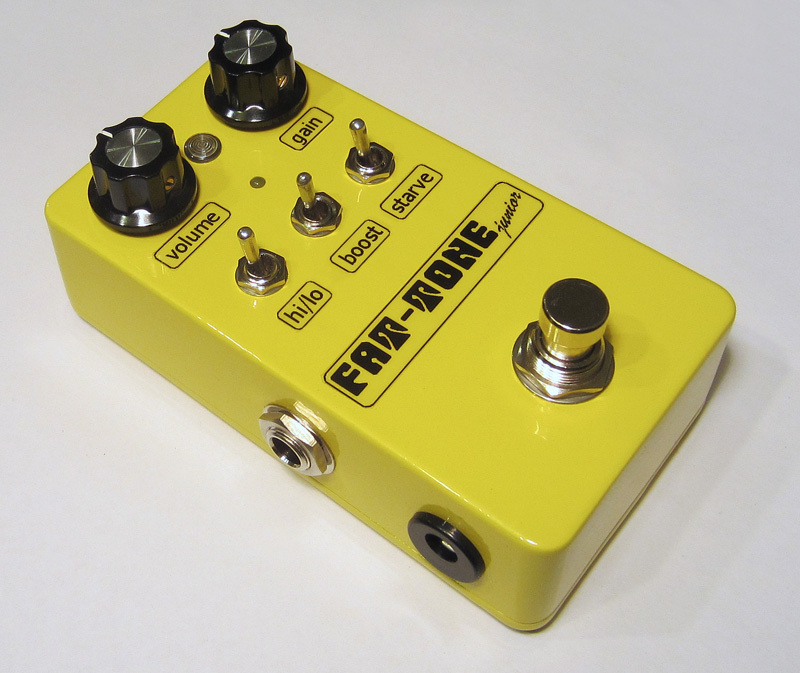 My newest smaller version of the 'Fat-Tone' called the 'Fat-Tone Junior'. It has all of the same features of the larger model, except that the boost switch is on a mini toggle instead of another foot switch, plus it has a hi/lo frquency switch (more low end). This one's in an 1290B enclosure.